The Capitals unveiled their uniforms for the Winter Classic versus the Pittsburgh Penguins on January 1st. The uniforms are a kickback from the jerseys the organization wore from 1974 through 1995 before moving to then the MCI Center and getting a uniform make over. The unveiling featured three great Caps captains Yvon Labre (left), Alex Ovechkin (center), and Rod Langway (right). The unveiling was apart of Caps Con, the second ever Capitals convention that invites fans a closer look into the team they love. Nearly 7,000 fans attended the event this year at the Washington Convention Center. Fans had a chance to meet their heroes as well as partake in forums and round table discussions. The Caps will finish their preseason against Nashville tomorrow (Sunday) at 12:30 pm before opening their season on the road against Atlanta on October 8th. Former Cap Olie Kolzig attended the Convention. An interview can be found here. 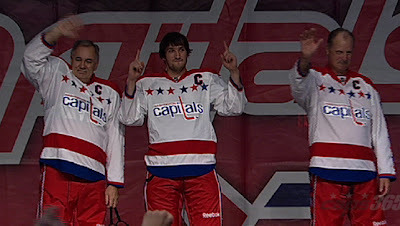 Probably the best commercial Ovi has done yet. Photo courtesy of Caps PR.